business in a straight-forward, cost-effective manner. We will perform a complete on-site evaluation of your existing network or, if you currently have no network, evaluate your need for a new network based on your current and future information management needs and goals. You will receive a written analysis with recommendations and all costs involved. We will upgrade your server(s) and workstations where practical, and/or install new equipment where necessary. HAL Systems has been deploying high quality, high reliability servers and workstations for over 17 years. We are very experienced in network design, server/workstation installation, configuration and deployment. We also handle the latest technologies including server virtualization and NAS/SAN storage solutions using Open-E* storage solution software. 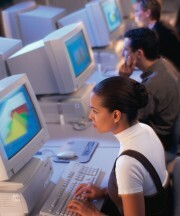 Every network requires maintenance and administration. However, most small to mid-size businesses do not require full-time administration, which is usually very costly. Full-time network administrators can draw salaries of $50,00 to $80,000 or more depending on their level of expertise and experience. .... and more. By having our professionals remotely administer your entire network, you eliminate the costs of having the need for a full-time network administrator on staff. Moreover, much of the work that we do is performed after hours so that your work is not interrupted during the day. Contact HAL Systems and let us show you how we can save your business thousands of dollars in network admin costs each year. Open-E, Inc is a leading provider of unified file and block storage management software solutions. The Open-E Data Storage Software (DSS V6) offers support for Network Attached Storage (NAS), iSCSI, InfiniBand and Fibre Channel SAN (Storage Area Network) functionality all in a single, easy to use storage application. Open-E DSS also provides, Automatic Failover and Failback for high-availability, Remote Mirroring for disaster recovery, WORM (Write Once Read Many) support for digital archiving, and NDMP (Network Data Management Protocol) support for universal backup - ensuring better data security, increased fault tolerance, and improved availability of all data, ultimately delivering better overall performance and value.